PORTLAND, Ore. — What slow start? The Portland Timbers have recovered and then some. A 15-match unbeaten streak has moved the Timbers into second place in the Western Conference behind FC Dallas. The streak started with a 3-2 victory at home over Minnesota on April 8. 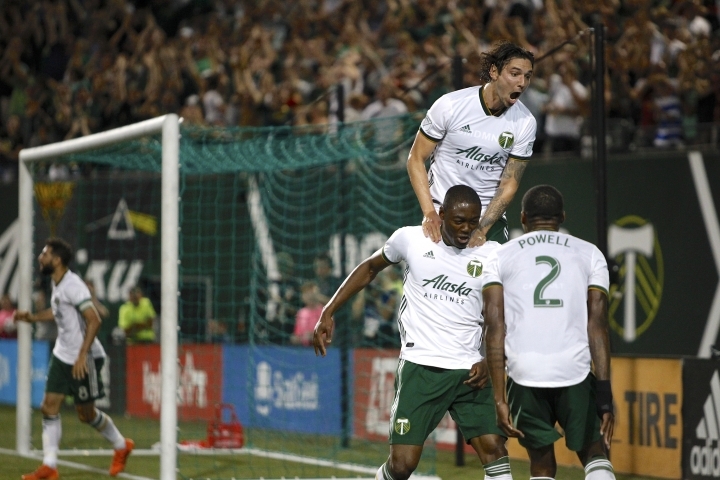 The latest win was a 3-0 victory over the Philadelphia Union last weekend that gave the Timbers their longest MLS undefeated streak since they also went 15 games without a loss in 2013. Portland is the only team with two streaks that long. The longest unbeaten streak is 19 games, set in 2010 by Dallas. Portland's streak is also the longest in the league this season. "Everyone is buying into what we're preaching," goalkeeper Jeff Attinella said. "Everyone is fighting each game and we're taking each game just as seriously as the last one. We're just going to try and keep it rolling." It has been a dramatic shift from the start of the season when the Timbers started with five games on the road — because of construction at Providence Park — and were unable to come home with a win. And home has been key to Portland's success. The Timbers (10-3-7) have yet to drop a game at home this season. In fact, the team has not lost at home in 16 regular-season matches dating back to last season. "We are doing well," said Diego Valeri, the league's reigning MVP who leads Portland with eight goals this season. "I am very happy about the run we're having." Portland, which has 14 games left, is heading into a Cascadia Cup rivalry match at home this Saturday against the Whitecaps, who sit in seventh place in the West. But first Vancouver faces Toronto FC in the first leg of the Canadian Championship on Wednesday night. The Cascadia Cup is the three-way rivalry between the Timbers, Whitecaps and Seattle Sounders that was started by rivalry groups before the teams joined MLS. Portland and Seattle sit atop the table with three points apiece, while Vancouver has none. The Whitecaps were coming off a 2-2 draw on the road to NYCFC, stretching their undefeated streak to three games. "We have confidence in the team, so we've just got to keep pushing forward," Whitecaps forward Erik Hurtado said. MATCH OF THE WEEK: Sporting Kansas City (10-6-6) moved into third place in the West with a 1-0 victory last weekend on the road against Houston. The team is on the road again this weekend for its first meeting with expansion LAFC (10-6-6), which is in fourth and jostling with Sporting for playoff position. LAFC was coming off a 2-1 loss on the road to the New York Red Bulls on Sunday. PLAYER OF THE WEEK: San Jose's Vako was named the MLS Player of the Week for his two goals last Saturday against FC Dallas. The Earthquakes pulled off the 3-1 upset on the road. Vako scored in the 19th and 88th minutes for the Quakes. He has six goals on the season. WATCHING ATLANTA: The Timbers were continuing their upward swing, but Atlanta remains the hottest team in the league. The Union, the first team in MLS to hit the 50-goal mark this season, sit atop the Eastern Conference at 14-4-6 with 10 games left. They are also atop the race for the Supporters' Shield. Striker Josef Martinez leads the Golden Boot race with 26 goals in just 24 matches — and he's 11 goals in front of his closest competitor. He's just one goal away from tying the single-season record held by three players: Roy Lassiter of the Tampa Bay Mutiny in 1996, Chris Wondolowski with the San Jose Earthquakes in 2012 and Bradley Wright-Phillips with the New York Red Bulls in 2014. Martinez already broke the league's career hat-trick record this season with his sixth. Next up for Atlanta is a match at home against the Columbus Crew on Aug. 19.